On Mars you will have direct access to a live up-to-date weather forecast [your life may depend on it]. 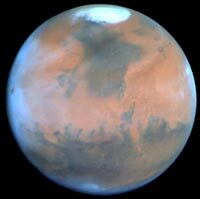 Martian weather forecasting is made possible through the Martian Atmosphere Reconnaissance Satellite System [MARS System]. The data is fed into STAN II[State of The Art Neuroputer II], based in Areopolis, which calculates the weekly, monthly and annual Martian weather forecasts. Weather at Areopolis is sunny, no clouds, with a 258°K (-15°C) daytime and a 210°K (-63°C) nighttime surface temperature. Temperature is expected to remain stable the following 10 sols. Dust content at Areopolis is 20 on the McLewin Scale and rising. It is Northern Autumn on Mars now so its near perihelion again. Colonists all over Mars are bracing themselves for another annual dust storm. The storms increase in strength each Martian year due to the increasing Martian Terraforming Effort.